Latest technology Android phone allows you to easily use emoji. Lot of old technology Android phone does not support emoji. This article allows you how to use emoji on any Android phone. Before few years ago we are able to send simple smile symbol to other Android phone like this :-) or :-( . Few Android mobile manufacturing companies provide facility to use emoji on any Android phone. Few mobile companies does not provide the facility to use emoji on your Android phone. Now there is no need to worry after reading this article you will be able to easily use emoji on any Android phone. First you have to know what is the Emoji? Emoji is a small digital image which is used to express any idea with the help of latest electronic communication. With the help of emoji you can easily express your emotions. WhatsApp already has the emoji built in feature. During sending the normal text messages to other person you have to add emoji during sending the message to others. But first you have to check your default keyboard support emoji option or not. If default keyboard of your Android phone does not support emoji options then you have to change keyboard with others. You have to download and install Google keyboard which is free to available on Google Play Store. If default keyboard of your Android phone does not support to emoji option then you have to take following steps to use emoji on any Android phone. Step 1: Download and install Google Keyboard from Google Play Store. Step 2: Tap on the “Settings” option > Tap on the “Language and Input” option. Step 3: Tap on the “Current Keyboard” and tap on the “Choose keyboards” option. Select the new keyboard for the default settings. Step 4: Now start typing the new message tap on the smiley face icon which is placed at the bottom right corner. Now you will get lot of emoji icons, you have to swipe either right or left and choose any emoji as per your need. After applying all these steps you will be able to easily use emoji on any Android phone. The emoji either used during sending the message to other from normal message or from WhatsApp. During using the emoji on normal text message your new keyboard is used at the place of default keyboard. After quit or swap to another app you will be back to your normal default keyboard. If Lot of old technology smartphone does not support Google keyboard for emoji then you have to use WhatsApp feature. WhatsApp already has built-in emoji feature which is used during sending the message to each other. 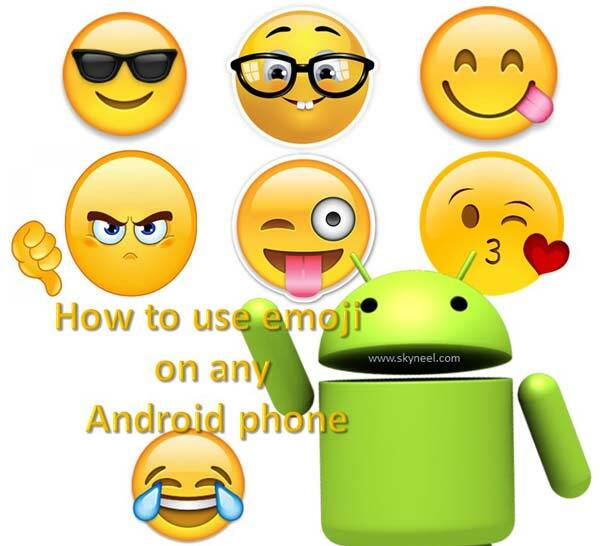 After reading this article you will be able to know how to use emoji on any Android phone. Emoji symbol express your emotions in-terms of icons or symbols. These emoji is a good way to explain your feelings for someone. If you have any suggestion regarding this article then write us in the comment box. Thanks to all.